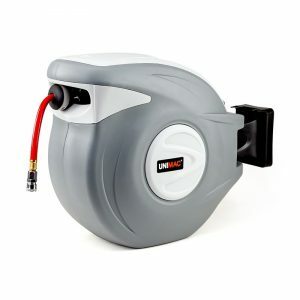 This commercial grade air hose reel is the largest in Unimac’s latest range, boasting a huge 30 meter hose that offers you the freedom to move all over your workshop from a single connection point. 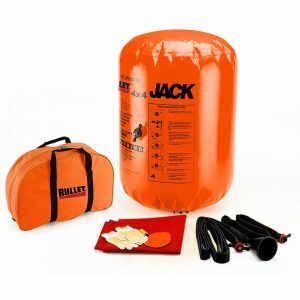 The hose is made up of ultra-durable PVC with quality stainless steel 1/4 NPT quick connect fittings. 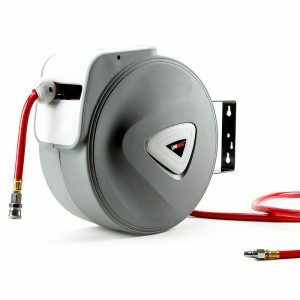 The 2 meter leader hose connects onto the side of the unit and provides ample length to reach a compressor situated close by. 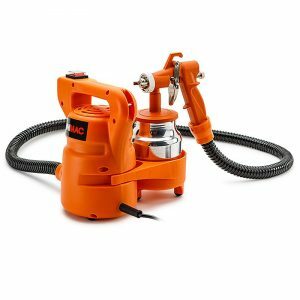 The smooth spring-loaded hose has a convenient incremental feed lock that ensures your tools stay by your side wherever you take them. When you’re done, a firm tug on the hose activates the unit’s automatic rewind system. 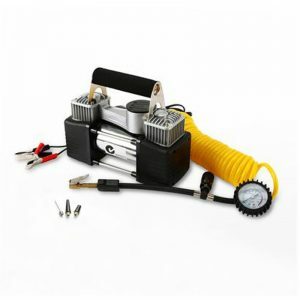 Moreover, its self-layering mechanism ensures that the hose is neatly and evenly wound within the casing.